Snapchat’s been having a rough go of it lately. They’ve just rolled out a newly designed version of their app, to great disdain from its users. They’re unhappy and it’s not clear what long term effect the redesign will have on user growth and engagement. The good news, however, is that after years or waiting, brands and creators finally have some analytics about their public stories. I’ve written before about my Snapchat experience. Once I made my stories public, every time I open the app a hundred new people had added me. They aren’t people I know, so I’m not sure exactly how they found me. Regardless, my public snaps seem to get between 5 and 8 thousand views, without fail. The only metric I really didn’t know was a total number of overall followers. That metric is less important for me, some random guy in Cleveland, Ohio. Where it’s important is for “influencers,” content creators, and especially brands. Those audiences were not seeing follower metrics and had to manually track story views by taking screenshots. Seriously – I’ve read stories about some of those influencers who had to be sure to be on their phone near the 24 hour expiry time to get that final tally of views. That’s not brand friendly. 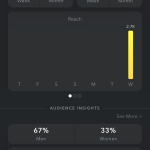 Snapchat has been hearing this feedback for years, and yesterday finally launched some analytics information to users. While that elusive follower count still isn’t there, there is some interesting data to dig into. Below are two screenshots of my analytics that I took this morning. The top metrics they share are “story views” and “view time.” Story views gives you a breakdown of yearly, monthly, and weekly views. The other side shows view time, which shows the total number of minutes viewers spent watching a story. If my math is right, 151 hours have been spent watching my stories by people around the world this year. The reach area there in the middle has three views, reach, average view time, and story view percentage. These stats are updated once a day. The other interesting section is on demographics. 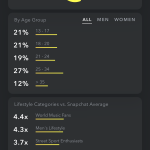 Again, no hard count, but you can see the age ranges of your audience and on a second screen, drill down into their age groups and demographics. These demographics include interest categories and location info. I’m big in Paris, I guess. You can click on one of the thumbnails for a few image. This is a good start by Snapchat to gain the trust of brands and influencer users. With all the user uproar and threats of users to abandon the platform for Instagram, the company needs to ensure their key partners stay around. A truck company might not care if a creator has 200,000 views a day, but if they can show those views come from men age 25-34 in the Midwest who like the outdoors, the business could pay $50,000 for the creator to feature their trucks in their Snaps. If any brands out there want to hire me as an influencer to reach 25 to 34 year old users in Europe who are into world music and men’s lifestyle topics, hit me up. in the end, this is a push for Snapchat to keep people creating on its platform. If brands are creating content, and they can now see how that content is reaching users, they will keep Snapchat in their social media mix. Good social content will then keep the users engaged and opening Snapchat several times a day. 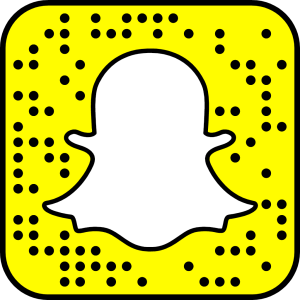 Snap can sell more ads, and the cycle continues. Perhaps this will push Instagram next to push better analytics for brands. We’ll see.